The world is moving rapidly on withdrawing the social licence of carbon polluters. As the impacts of climate change become clearer and the urgency for rapid action impresses itself on the public psyche in the lead up to the Paris climate talks in December 2015, the major carbon polluters will increasingly find it more difficult to operate with social support. The longer these fossil fuel companies delay making amends for the damages their businesses have already caused and will cause in the future, the more culpable they will become. Up until relatively recently, responsibility for addressing climate change has largely been seen as the role of the Governments of nation states and the necessary multi-lateral action through the United Nations Framework Convention on Climate Change to regulate carbon pollution. But action through the UNFCCC has been extremely slow, often hindered by corporate lobbying and voting block interests. But recent research by Heede (2014) has shown that individual investor or state owned corporations are responsible for a substantial majority of greenhouse gas pollution causing climate change. Heede's landmark paper was on Tracing anthropogenic carbon dioxide and methane emissions to fossil fuel and cement producers, 1854-2010. This research found that the 90 largest industrial carbon producers, fossil fuel and cement corporations, are responsible for nearly two-thirds of all known industrial greenhouse gas emissions since 1751. More than half of all industrial emissions have occurred since 1988, after carbon emissions and the greenhouse effect were clearly identified as a problem through direct observational data. Remember James Hansen presenting his evidence before Congressional committees in 1988? That was the same year that the United Nations established the scientific review body, the Intergovernmental Panel on Climate Change (IPCC), to review and present the scientific evidence on climate change. A new peer reviewed paper by three academics published in the journal Climate Change - Peter C. Frumhoff, Richard Heede and Naomi Oreskes - argue that these companies should carry a significant responsibility for climate change. The Essay is titled The climate responsibilities of industrial carbon producers. Oreskes is a highly regarded science historian, with a background in geology, who co-authored the book Merchants of Doubt which identified parallels between the fossil fuel company disinformation and obfuscation campaign on climate science and climate policy,and previous misinformation campaigns, especially the tobacco industry. The essay is relatively easy to read and accessible. It asks a number of questions about the carbon majors, including defining What is responsibility? ; Quantifying the responsibility of industrial carbon producers; Articulating the Response of industrial carbon producers to the evidence of anthropogenic climate change; outlining What did the industrial carbon producers do instead? ; and summarising What are the industrial carbon producers doing now? 3) accelerate their transition to the production of low-carbon energy." But don't get your hopes up. These companies have continued to show poor social responsibility on carbon pollution and climate change. These companies as major corporations had a high level of internal scientific and technical expertise to judge and assess scientific data. Instead many of the companies formed the Global Climate Coalition (GCC) and chose to oppose greenhouse gas emission reduction policies. They purposefully obfuscated the scientific debate for decades ensuring little policy advance in transition to low carbon energy economy. Indeed, some companies such as Peabody Energy continue to reject the scientific evidence, according to the researchers. The companies have continued their high risk extractive exploration policies which will contribute to disruptive climate change, such as Shell's Arctic drilling in the Chukchi Sea which was protested recently in Seattle, BP deep water oil drilling in the Mexican gulf, or BP's deep sea oil exploration in the Great Australian Bight. 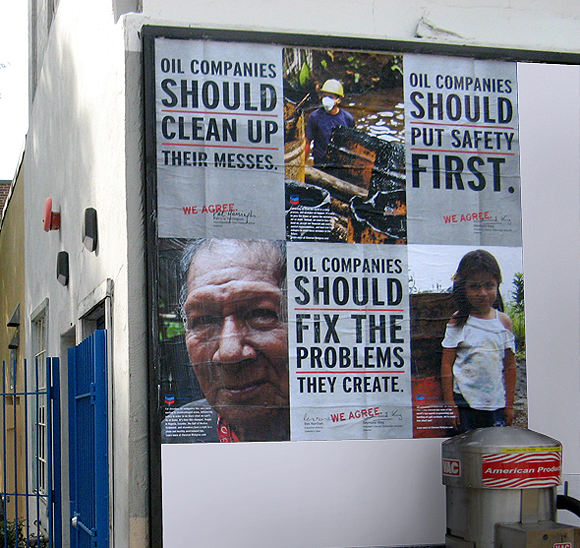 "fossil fuel producers, particularly in the United States but also in Australia, Canada, and the United Kingdom, have sought to discredit and disparage the scientific evidence, and to deny, diminish, or discount the reality and significance of climate change as a problem (Gelbspan 2005; Ward 2006; Oreskes and Conway 2010). Many companies lobbied to prevent policies that would encourage the transition to low-carbon energy and continue to do so today, including through the influential industry trade associations on whose boards of directors many of the largest companies sit (Wieners 2014)." The authors discuss the concept of responsibility as being central to the question of obligation to act, and the changing notions of corporate responsibility in civil society and social license. "A corporation’s ability to return value to shareholders is influenced by, and in the long run depends upon, social license." An alternative path was possible for these companies to become diversified energy corporations. Indeed, British Petroleum CEO John Browne even gave a rousing speech at Stanford University in 1997 that the company business model would move "beyond petroleum". But such a transition proved to be short lived and added only a veneer of company greenwashing instead of the depth that was outlined in his speech. Instead BP went deep sea oil drilling in the Gulf of Mexico precipitating the Deepwater Horizon oilspill disaster. Carbon capture and storage has long been talked about as a way to continue burning fossil fuels but reducing their climate impact. The fossil fuel majors with their expertise in drilling technology and injection of fluids underground under pressure had the capability to assess and develop carbon capture and storage (CCS) technologies. "By 1988, recognizing the need to reduce the risks of their products, these industries could have invested in adapting Enhanced Oil Recovery (EOR) technologies for the purpose of long-term carbon storage. But they did not." argue the researchers. Some of these companies, such as BP, Shell, and ExxonMobil, have developed detailed projections of future energy use whch would have the world continue to burn fossil fuels in increasing quantities which will push temperatures well past 4 degrees of warming by the end of the century. "In Energy Outlook: 2035, BP envisions that global CO2 emissions from energy use will continue to grow on average by 1.1 % per year, bringing emissions in 2035 to nearly double levels of 1990 and temperatures towards or above 4 °C by the end of the century, by their own admission well above the path recommended by scientists… (BP 2014). Shell explicitly acknowledges that the energy futures they envision will have highly disruptive consequences, Bovershoot[ing] the trajectory for a 2 °C goal (Royal Dutch Shell plc 2013). 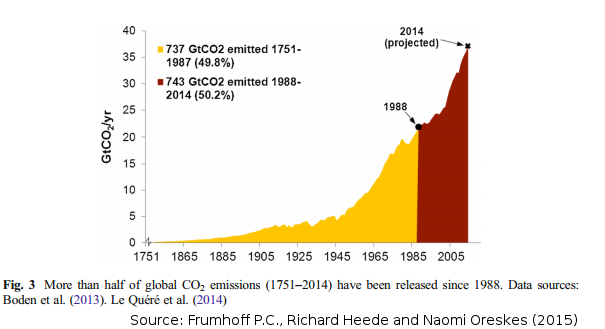 Yet, knowing this, they continue to bank on a high carbon future." The companies systematically engaged in actions and campaigns to prevent policy action that might have stabilized or reduced carbon emissions. Actions such as promoting disinformation were clearly unethical practices. 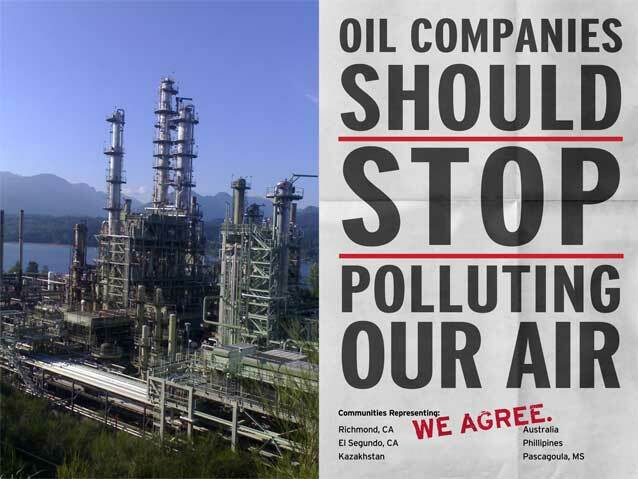 While many of these companies clearly acknowledge the threat posed by continued fossil fuel production and consumption, they continue to engage in business practices and plans for expanded production and use for decades to come. Governments have to a large extent, so far failed to regulate these corporations and their carbon pollution of our atmosphere and oceans. 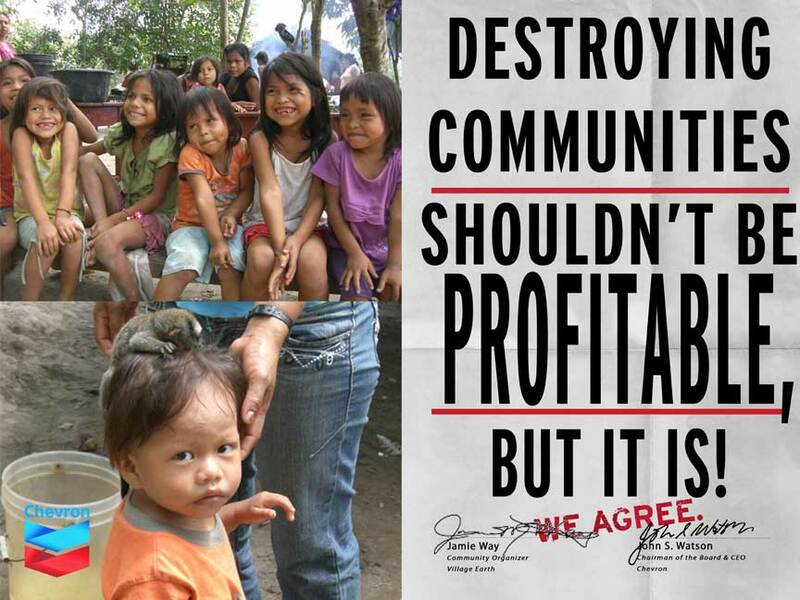 It is clear that these companies are not going to accept their social responsibilities of their own accord. So societal action is needed to engage them whether this be continued attempts at policy action and regulation through government; via shareholder action in transparency of reporting climate and carbon risk in their business plans; divestment campaigns; public naming and shaming; consumer boycotts; and litigation for civil damages. Earlier this year at a meeting in Port Vila, Vanuatu, several Pacific Island Nations have threatened legal action against major climate polluters. Courts are also starting to hear cases with climate mitigation implications. In June this year Teens won an interim lawsuit in climate change case in Washington State, while a Dutch Court orders Netherlands Government cut CO2 emissions by 25 percent by 2020. 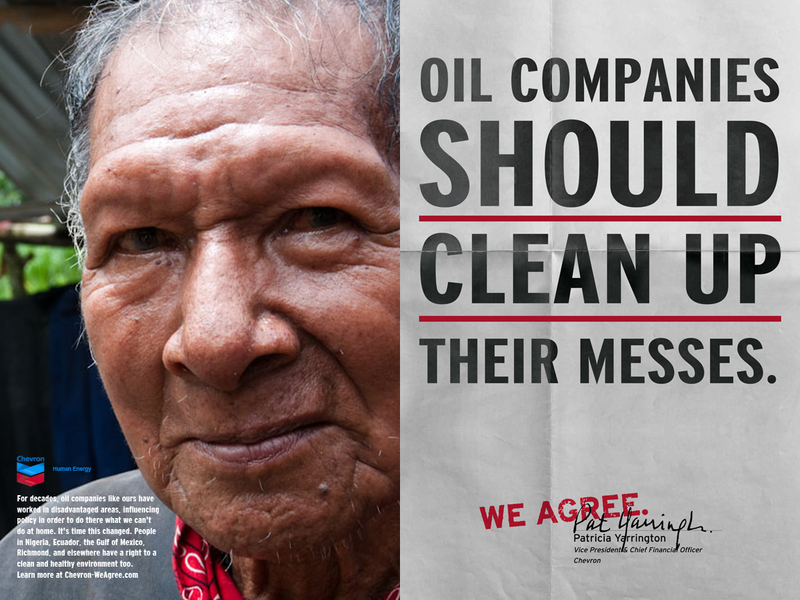 "We commit to holding those most responsible for climate change accountable. By doing so, we send a message of hope that the people and not the polluters are in charge of humanity’s destiny. We commit to bring a case that would investigate the human rights implications of climate change and hold the big carbon polluters accountable to appropriate international bodies or processes." 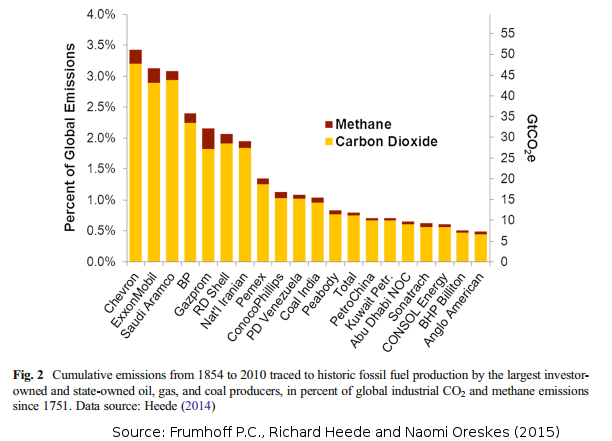 The essay by Frumhoff, Heede and Oreskes adds more weight to possible litigation against these major fossil fuel companies that have failed to take proper social responsibilty for their carbon pollution and hence contributed to present climate impacts and continue to contribute and plan for greater climate disruption, future impacts and damages for present and future genmerations.